I’m a huge fan of the Mario Party series – well, most of them, anyway. Way back in the day, my all-time favorite Mario Party game was number 4. It’s not anymore, but it still holds a special place in my heart. Mario Party 4 was originally released on October 21, 2002, for the Nintendo Gamecube. Kris and I played this one to death. We absolutely loved it. Every time we played, we played on a team. It was always us versus two hard CPU. We’d always crush them, but it would be close and we’d have a blast every game. Then we’d play just the mini-games because there were two that were our absolute favorites: Team Treasure Trek and Dungeon Duos. The first game was a maze – one needed to find the chest and the other needed to find the key and meet up somewhere to win. Dungeon Duos was an obstacle course inside a dungeon, cave-like place. It was always a good time and when we recently got our Gamecube back up and running, we decided to play a round of Mario Party 4. You know, for old time’s sake. However, the game is so easy. Even the CPUs on the hardest setting was dumb. The mini-games were still fun, but the gameplay with the CPUs on the boards wasn’t. It was definitely a lot harder when we were kids… or maybe we just weren’t as good as we thought. Still, we won each time. It was fun to go back to it again though. I’m sure we’ll play through the game on stream sometime. I want to give it a shot again even though it was way easier than I remembered it. Have you played Mario Party 4? Let me know in the comments below! If you liked this post, please share it around. 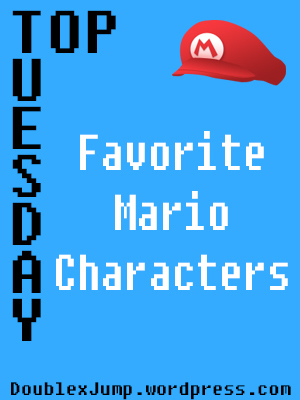 With that said, I decided to talk about my favorite Mario characters because… Well, why not? Kris and I watched the Super Mario Bros movie with Bob Hoskins the other night (it’s such a bad movie, but we love it anyway!) and I think that’s what got Mario stuck in my head. It’s hard to narrow down just five characters from the Super Mario world, but these were the first five that I thought of. I figured they must be my favorite if I thought of them first. Chain Chomp always had a soft spot in my heart. He’s the “dog” in the Mario world and who doesn’t love to have a dog? Sure, Chain Chomp can eat you, but I’m sure he would make a lovely pet. In games such as Super Smash Brothers, Mario Kart, or Mario Party, I never play as Bowser. I don’t know why I just don’t. But Bowser is such a great character. I love his personality, especially in the Paper Mario games. He’s witty and funny and I enjoy that he actually joins Mario in some games. He’s not bad, he just makes the wrong choices. I’m afraid of ghosts, but I love Boo. I don’t know what it is about Boo, but he’s adorable and his voice is funny. I’ve always enjoyed the Boo houses in any Mario game and especially love Luigi’s Mansion. I’m drawn to those kinds of games for whatever reason. Who doesn’t love Luigi more than Mario? No offense, Mario. Luigi is my spirit animal. He’s afraid of the world, but is strangely drawn to ghosts for whatever reason. Who are your favorite Mario characters? Let me know in the comments below!